Strong warning from the Crime Technology Suppression division of the Royal Thai Police reminds holiday revelers of the serious penalties for uploading photos or videos that may be considered obscene. 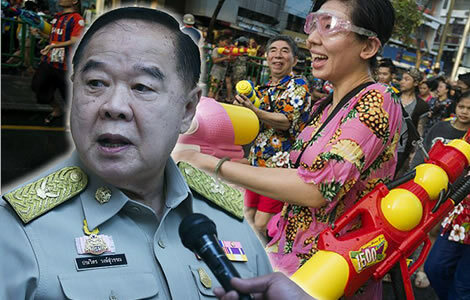 The Deputy Chief of the unit warned the Thai public and all those taking part in the Songkran spectacle and festivities that it is not possible to defend serious charges under Thailand’s Computer Crime Act for uploading such content to the internet under Thailand’s sweeping and draconian Computer Crime Act on the basis of not realizing the danger or making a mistake. The stern warning specifically identifies photos and videos of Thai women in scanty costumes and engaging in licentious behavior or provocative images of the Thailand’s transgender community. Meanwhile, Thailand’s Deputy PM has warned potential drunk drivers causing death over the holiday period that they will face murder charges for their irresponsible actions. Thailand has commenced its annual Songkran celebrations which mark the beginning of the old fashioned or traditional Thai new year. This year, Thai authorities have, however, issued stern warnings to revelers and drivers to be more aware of the law not only on Thai roads but also online during the holiday period. Thailand’s elite crime technology suppression police have issued a strong warning to those taking part in Songkran celebrations not to post obscene photos or videos of Thai women in scanty costumes, people engaging in licentious behavior or images that may be considered obscene or offensive to Thai cultural sensitivities. The police have particularly warned against provocative photos or videos of Thailand’s transgender community. Meanwhile, authorities are also determined to make Thailand’s roads safer for the holiday period after last year’s carnage which saw over 400 deaths and nearly 4,000 injured. This includes a stark warning to drunk drivers from Thailand’s influential Deputy Prime Minister that if they cause death, they will face murder charges. Thailand’s influential Deputy Prime Minister this week warned that any drunk drivers arrested over the Songkran holidays will face murder charges if they are the cause of fatal accidents. His stark warning came days before the Deputy Chief of Thailand’s Crime Technology Suppression division issued another strong message to those enjoying the period’s revelry and high jinks. He warned that Thai police would be increasing surveillance during the holiday period and would pursue those who uploaded offensive or obscene images of Thai women in a state of undress or images which suggest licentious behavior. He also warned against provocative images of Thailand’s transgender community. The police boss said that there was no defense, at a later stage, to the serious charges that could arise under Thailand’s sweeping Computer Crime Act which can see those convicted under the strict liability law, face up to five years in prison. Thai people begin their annual Songkran holidays this week as they celebrate the country’s traditional new year. The extended holiday runs from April 12th to 16th but many Thai people make the old fashioned and much loved new year’s holiday last a little longer. This national holiday is a time for revelry and festivities throughout the country. It is also a time for reuniting with family when many Thai people make their way back to the rural homelands. For foreigners, it is time of gaiety and fun on Thailand’s streets with water cannon in what is the hottest time of the year. The Songkran festival is becoming more popular with foreign tourists each year particularly young western men and women. To many of these western visitors, the highlight of the holiday is the opportunity to engage in good natured street water fights with high powered water cannon. This year, the Thai police have issued a warning to the public participating in the annual holiday antics to exercise caution and preserve order in the country. They specifically warn people engaging in high jinks not to share online pictures of Thai women which are licentious or indecent. The stiff warning also singled out provocative photos or videos of transgender people in Thailand enjoying the holiday which may jar the cultural feelings of many more conservative and traditional Thais. Police warned that those who disregard their instructions would face heavy penalties including fines and up to 5 year in prison. The strict warning came this Wednesday from the Deputy Chief of Thailand’s Crime Technology Suppression division. The police chief warned that photos and video clips uploaded to the internet would be used as evidence of obscenity in public. He also pointed out that offenders, once arrested, may not have the opportunity to make excuses. The police boss was referring to Thailand’s powerful and draconian Computer Crime Act. Under Section 14 of the law which has been lightly used up to now, anyone who uploads offensive or obscene photos or media to the internet is guilty of a serious offence. Those convicted under the law face a fine of ฿100,000 as well as up to five years in prison. The police chief underlined the determination of the Royal Thai Police to strictly enforce the law over the traditional holiday period. He pointed out that the police would identify those infringing the law and bring them to justice ‘wherever they are’ while adding, significantly, that anyone arrested under the law has no defense in claiming that they were unaware of the danger of such actions and the severe punishments that the law applies if convicted. The laws impose strict liability on people to comply with its provisions which makes defending charges extremely difficult once police or prosecuting authorities can show that offensive material was uploaded. The subjective nature of what is deemed offensive and obscene should also make revelers or online pranksters beware. Thailand is a very conservative and traditional country, a point that many foreigners and westerners often fail to understand. Police Colonel Siriwat Dipho explained that the Thai police had issued the robust warning following a spate of such images in recent years. The police boss said that such photos and videos were not acceptable and were offensive to those who support Thailand’s traditional culture. ‘We don’t want any person to imitate these acts. We must keep a good Songkran tradition,’ the police chief said. He confirmed that Thai police personnel would be intensifying their online surveillance activities over the course of this Songkran holiday period. The tough line comes as Thai police and security officials have also turned their attention toward the huge loss of life each year which results from the Songkran festivities on Thailand’s dangerous roads. Last year, 418 people died on Thai roads during the Songkran period and nearly 4,000 were injured. The 7 effective days of the celebration have become known in Thailand as the ‘Seven Dangerous Days’ following a government run awareness campaign that has been running since last year. The seven days run from April 11th to April 17th. Last week, Thailand’s influential Deputy Prime Minister Prawit Wongsuwan, announced that he had ordered the Royal Thai Police to charge anyone driving drunk over the holiday period and who has caused a fatal car accident to be charged with murder. The penalty and consequences of irresponsible behavior could not be made any starker than that. The new policy for prosecution will also encompass drivers found to be speeding where their actions have contributed to loss of life in a road traffic accident. ‘I am worried that speeding and drink driving can kill others. We must try to reduce deaths from these causes. So, anyone who violates speed limits or drives under the influence and causes death will be held responsible for murder,’ he said. Thai authorities have also introduced a policy of seizing vehicles used by drunk drivers. Thailand has, effectively, the most dangerous roads in the world with well over 20,000 people killed last year with nearly of three quarters of these being motorbike related. Drink driving and speeding are also huge contributory factors. Thailand has been warned by many international agencies such as the UN and World Bank of the huge impact of road traffic deaths on the country’s economic performance as well as the human suffering that has already impacted a huge number of Thai families including those who have suffered severe injuries. During Songkran, Thai police will be paying particular attention to 29 areas throughout the kingdom which have been identified as danger spots for road accidents. The Chairman of Thailand Road Safety Committee, Interior Minister, Anupong Paojinda, has also issued severe warnings to those who violate the law during this year’s holiday season.